There are about 200 toll stations in Norway. All of which are automated*, and marked with "AutoPASS" and the symbol to the right. Vehicles registered driving in Norway through automated road toll stations are subsequently invoiced. The invoice is sent by post (or e-mail if the owner has pre-registered via EPCs website). Vehicles with a tag** are entitled to discounted toll fees and will receive an invoice from their tag issuer. The automated toll stations are all equipped with a camera that reads the vehicle number plate and toll tags. In order to invoice foreign registered vehicles the Norwegian Road Authorities, Statens Vegvesen, must obtain access to various vehicle licensing’s authorities in the different countries. Foreign registered vehicles will be invoiced by Euro Parking Collection plc (EPC). EPC is an authorised service provider with authority to issue invoices to vehicle owners registered outside the jurisdiction of the issuing authority. It is on the basis of this authorisation that the invoice has been issued. 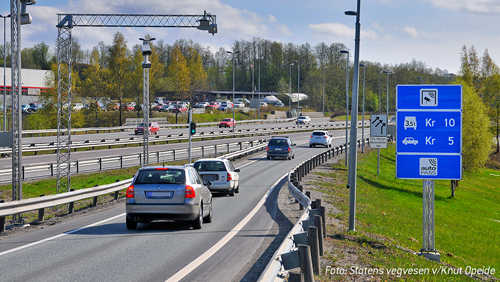 Statens Vegvesen and toll companies in Norway can invoice vehicle owners for toll passages in accordance with the Public Roads law paragraph 27. It is compulsory for heavy commercial vehicles over 3.5 tonnes to have a valid AutoPASS account before entering Norway. M1 categorised vehicles are now charged as small vehicles, if they have a valid AutoPASS account set up before entering Norway. For more information about this and the Norwegian road tolls, their location and how to set up a tag, please visit www.autopass.no/en/autopass. AutoPASS is the Norwegian system for the collection of road tolls. It is owned by Statens Vegvesen (Norwegian Public Roads Administration). Who has to pay for tolls in Norway? Why does EPC collect payments for toll roads in Norway? In order to operate the toll stations efficiently, the toll road operators have outsourced the task of collecting payments from foreign vehicles to EPC, which specialises in cross-border payments and debt collection. Registering for an EPC account will normally reduce the time from your journey(s) to you receiving your invoice. Furthermore, you will have full control over where the invoices is sent, as well as accessing your invoices, checking due dates, viewing images, register for e-mail delivery and making payment. You may at any time notify EPC about changes or cancel the registration. Please register to get started. No, normally not. In most cases EPC offers the customer a choice between payment to a bank account in their local currency or to a Norwegian bank account. This option is available in Austria, Belgium, Czech Republic, Denmark, Finland, France, Germany, Hungary, Ireland, Italy, Latvia, Lithuania, the Netherlands, Norway, Poland, Portugal, Romania, Slovakia, Spain, Sweden, Switzerland and the United Kingdom. The invoice is issued in the local currency, based on the exchange rate of the invoice date. It is also possible to pay by VISA or MasterCard. Questions and appeals should be addressed to EPC online at www.epcplc.com/communication. This will enable EPC's staff to handle your case. For some countries – it is possible to dial a local number which is redirected to EPC’s multilingual customer support. The price rate will be the same as regular domestic calls in your country. The customer support line is open every UK working day between 08:00-17:00 GMT. You can also request a call back. It took some time from when I travelled to Norway to when I received the invoice –why? If you have received a notice with a surcharge for a passage through Svinesundsforbindelsen prior to 1st November 2015, you would have received this because you did not stop and pay at the toll station. Prior to 1st November 2015, Svinesundsforbindelsen was manual. You have not paid the invoice in due time. I have received an invoice from the EPC, although I had an AutoPASS. What happened? In rare cases it may be that a payment point you have passed is not registered by our system. If the invoice from EPC is just for the road toll, it has to be paid (using the payment methods on the invoice). If you have received a fine, send a copy of the invoice to visitors@vegfinans.no, and they will make sure that you only have to pay the road toll. * The only manual toll station left in Norway where you cannot pay with a tag or be invoiced later, is Atlanterhavstunnelen. You will have to stop and pay before you drive through this toll. ** Visit www.autopass.no/en/autopass for further information and how to order a tag. Register your exemption for heavy M1 vehicles or zero emission vehicles when you order a tag. An AutoPASS tag is free of charge, you will only need to pay a NOK 200 deposit which will be refunded when you cancel the contract and return the tag. *** If you believe your vehicle is exempt, please register for an AutoPASS tag with a road toll company to register your exemption, or visit www.autopass.no/en/autopass for further information.